When you've decided that your old skis have finally taken their last run, head for Salomon Skis and check out the latest in hot performing boards for all types of terrain. All Mountain Skis are designed for people who enjoy skiing the entire mountain, both on and off-piste. Salomon Skis offers a complete selection of All Mountain Skis that are sold with and without binding systems. Skis with binding systems incorporate bindings into the construction of the ski. Skis without binding systems can accommodate most bindings designed for contemporary skis.The 12 models of All Mountain Skis vary in that they are meant for different skiing styles and types of terrain. Most come with similar features like Protrack Systems, Pulse Pads to dampen vibration, Titanium Reinforcements and wood cores. Similar in weight, the models come in four lengths - typically 154, 162, 170 and 178cm. Many models also offer additional features like Total Edge Reinforcement that add stiffness to the skis' edges and Full Wood Cores for better stability, more pronounced rebound during turn transitions and vibration filtering. If your thing is racing up the side of a halfpipe or sliding over the top of rails in your favorite terrain park, then Salomon Skis offer nine models of Freestyle Skis. Typically wider, with less sidecut than All Mountain Skis, Freestyle Skis feature wider waists, twin tips and more choices in camber. Many of Salomon's Freestyle Skis offer Edgy Monocoque - technology that improves the energy transfer from the skier, to the ski, to the snow. Twin tips help you to successfully land those big jumps, forward or backward. Because of their wider waists and reduced sidecut, Freestyle Skis are more stable at higher speeds, but more difficult to turn and are often available in only lengths longer than 181cm. For more information about choosing the appropriate ski length, please visit Love to Know's article on ski length recommendations. With a limited budget, you may only be able to afford to buy one pair of skis, so you may ask yourself, "Which ski is the best for me?" That's a simple question with a complex answer. Ask yourself what type of terrain do you find yourself skiing most often. If you enjoy cruising down smooth, groomers, carving tight turns, then look for a shorter All Mountain Ski with a shorter turning radius. If your focus is skiing off-piste or charging into terrain parks, then a Freestyle Ski may be a better fit for you. If you find yourself alternating between the two, then chances are an All Mountain Ski with a fatter tip and wider waist will be the best choice. 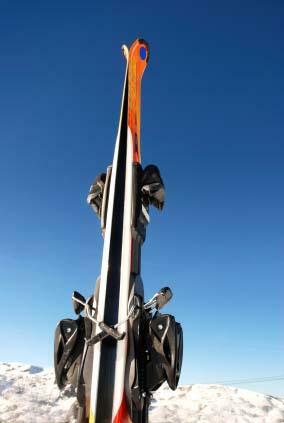 If money is no object, then add several pairs to your quiver of skis!